Marketers continue to await the arrival of paid search ads to voice assistants like Google Home and Amazon Alexa with bated breath. Salivating like a dog being taunted with a treat held just out of its reach, we wonder what voice ads will sound like, how well they will work, and what acronym we will use for them. I say PVAs, for paid voice ads. Okay, maybe I need to work on that a little. As hotly anticipated voice search ads are in the marketing set, consumers—a.k.a., you when you get home—await its arrival with equal measures of dread. Of course, the same survey shows that 63% of people who use voice search are actually using their phones to do it, which do in fact have screens. 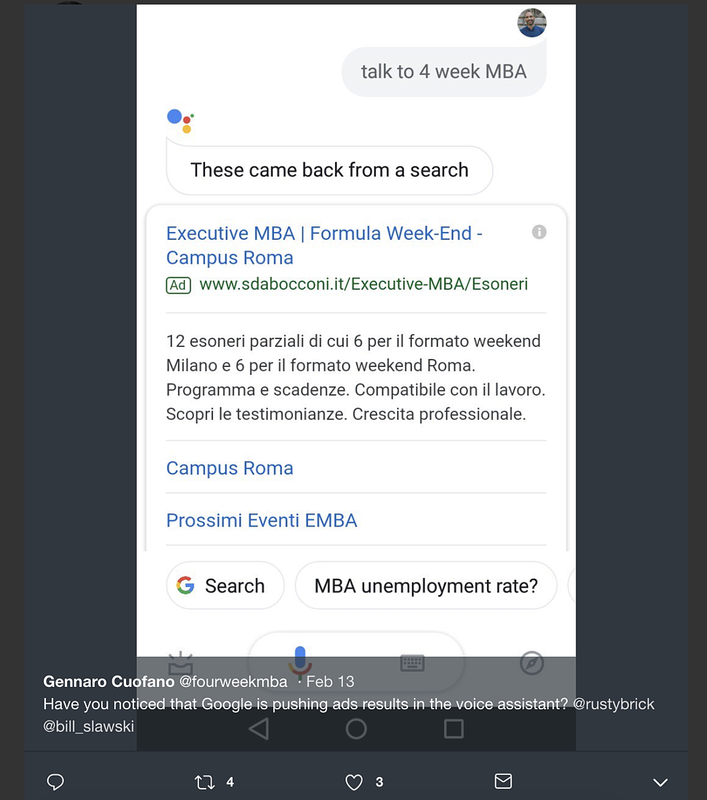 It has been reported that people have seen Google testing voice search ads in the wild on Android devices.